Personal Blog about Books, Lifestyle, Travel, Bikes and Things that Matter. Fresh out of Shanghai, China. Relocating to Hawaii: Driving Change after Six Years in China. 1 year ago We tend to become very comfortable as our careers and lives progress. We get settled... The post Relocating to Hawaii: Driving Change after Six Years in China. appeared first on Riot, Riot! . Hiking the Great Wall of China from Jiankou to Mutianyu 1 year ago Planning a trip to the Great Wall of China is always a gamble: will the... The post Hiking the Great Wall of China from Jiankou to Mutianyu appeared first on Riot, Riot! . Petra - A Wonder Of The World 2 years ago We have planned two days in Petra. The Unesco World Heritage site and 7th wonder... The post Petra â€“ A Wonder Of The World appeared first on Riot, Riot! . Patti Smith: M Train 2 years ago Patti Smithâ€™s memoir M Train is a delight. She drifts between dream and reality and... The post Patti Smith: M Train appeared first on Riot, Riot! . The Shanghai Project: Envision Pavilion by Sou Fujimoto 2 years ago Sou Fujimotoâ€™s Envision Pavillion opened at the Shanghai Himalayaâ€™s Center as part of the Shanghai... The post The Shanghai Project: Envision Pavilion by Sou Fujimoto appeared first on Riot, Riot! . 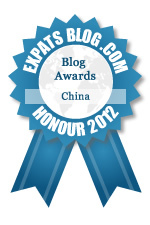 this blog captures well the life in and around china and gives some good recommendations on the side! makes you wanna come to Shanghai and experience this impressive city!! great blog!!!!! love it! just the right mix of everything. definitely a blog that every so called "expat" of our generation (who is not really feeling like one) can relate to... continue to share!